Please Read and Get Involved ASAP…We’re Searching for Teams and Participants. Youth Groups, School Groups, Church Groups, Social Groups, Friendship Groups, Class Reunions, Family Reunions, or simply Friends Getting Together For A Good Saturday Morning Activity, We Need You! Join The Diabetic Kitchen as we host our 2nd International 5K Walk/Run for a Cure for Diabetes and Alzheimer’s Caregivers Awareness. 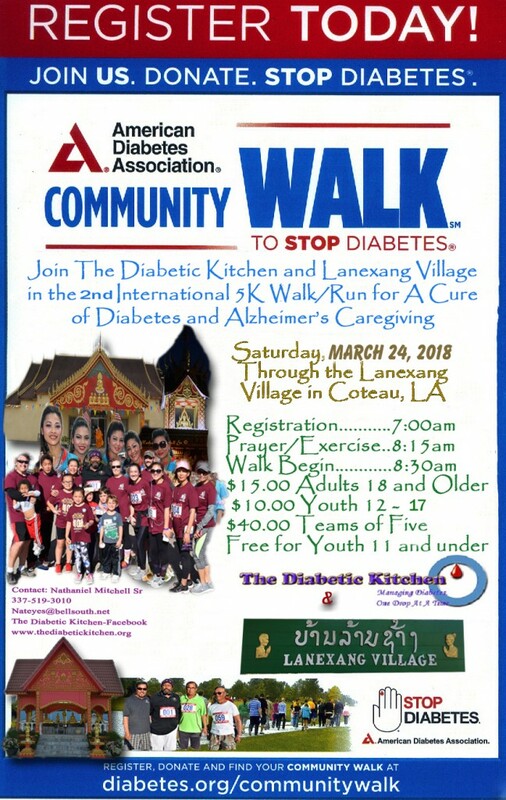 The membership of The Diabetic Kitchen has once again partnered with our Laotian Community to Host this International Event. I assure you that this event is a “Diamond In The Rough,” which draw together Men, Women, Youth of all persuasions together for a common cause and a Fun-Filled Family Outing. Please Consider This You Special Invitation to Participate. Thank You for Considering Our Initial Health & Wellness Event for 2018, Blessings.